Federal Law Enforcement 380 ACP AUTO Ammo 99 Grain HST Jacketed Hollow Point for sale online at cheap discount prices with free shipping available on bulk 380 ACP Auto ammunition only at our online store TargetSportsUSA.com. Target Sports USA carries the entire line of Federal HST ammunition for sale online with free shipping on bulk ammo including this Federal HST LE 380 ACP AUTO Ammo 99 Grain Jacketed Hollow Point. Federal Law Enforcement 380 ACP AUTO Ammo 99 Grain HST Jacketed Hollow Point ammo review offers the following information; 380 ammo by Federal Personal Defense is reloadable, non-corrosive and features nickel plated brass casing and boxer primers. Federal Personal Defense 380 ACP AUTO ammo is packaged in boxes of 50 and cases of 1000. Government contract Federal HST 40 S&W ammo featuring brass cases, 180 grain jacketed hollow point and non-corrosive boxer primer for sale at Target Sports USA. Federal Premium Law Enforcement provides top quality ammunition for shooters, including this 40 S&W ammo! The Federal LE 40 S&W is loaded with a 180 grain HST Jacketed Hollow Point bullet. The specifically designed hollow point tip will not plug while passing through different barriers and it holds its jacket during the toughest conditions. This Federal LE 40 S&W performs to the highest expectations, providing hard-hitting performance and deep penetration which delivers a devastating expansion! 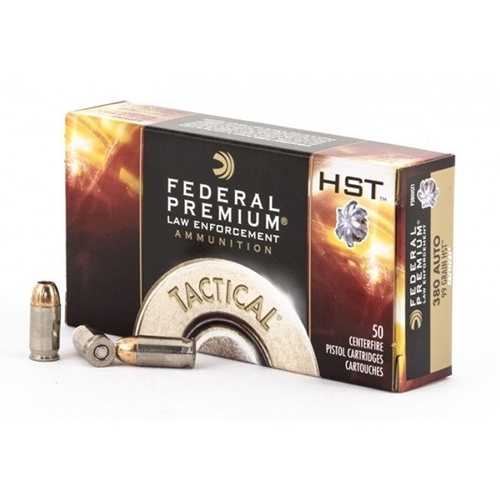 HST ammo made by Federal features nickel plated brass casings for smoother feeding and lower expansion then any other bullet casings including brass. Nickel plated brass can be reloaded for those shooters that reload their 380 ammunition. 380 HST ammo also features a non corrosive boxer primer and a 99 grain HST jacketed hollow point bullet. HST ammo is used by Law Enforcement Agencies throughout the United States and offers unmatched performance for personal protection ammo and duty hours. Target Sports USA offers Federal HST 380 ammo packaged in 50 round boxes, so you can afford to practice with the real thing and be prepared if needed to protect or defend yourself and others. The HST LE 380 ACP AUTO is non-corrosive, new production ammunition. 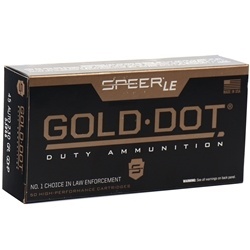 This Federal ammo is reloadable, featuring brass casing and Boxer primer. Federal LE 380 ACP AUTO is packaged in a box of 50 or a case of 1000 rounds. HST® offers consistent expansion and optimum penetration for terminal performance. Feeds reliably in my micro .380 which can be finicky. HST is the best there is. Great federal law enforcement 380 ACP Ammunition! Fast shipping! Will buy again!